The purpose of “Morgan’s Corner” is for parents and food allergic children to get a kid’s perspective on allergies. Not only do food allergies have a physical component, there’s the whole psychological aspect also. Being included with friends is difficult enough, and food allergies can impede that inclusion! Morgan is currently 23 years old and graduate of the University of Denver. He is anaphylactic to peanuts, tree nuts, sesame, fish and shellfish. He is severely allergic to dogs, cats and other furry animals. He gets eczema from food dyes and is allergic to grasses, weeds and trees. He received allergy shots for 7 years and saw a huge decrease in his seasonal and pet allergies! 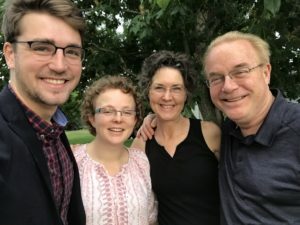 Morgan wrote a monthly column in AllergicChild.com’s monthly newsletter entitled “Morgan’s Corner” where he detailed the everyday challenges (and solutions) of living with food allergies. 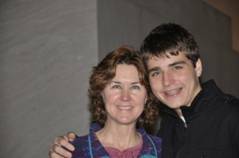 This column earned him national fame – ranging from being interviewed on NBC Nightly News to being a speaker to both teens and adults at conferences across the nation. He was a key person in the passage of SB 09-226, a law in Colorado requiring all school districts to have a policy to keep food allergic children safe at school, and helped flipped senators and representatives from a “no” to a “yes” vote through his testimony. 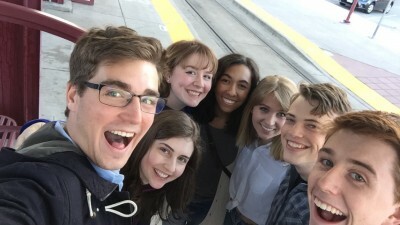 He’s a Boettcher Scholar, an Eagle Scout, was a member of the DU Pioneer Leadership Program, and the President of the University of Denver Roosevelt Institute – a student non-profit organization focused on empowering young generations in political change. Morgan’s main focus with food allergies is self-advocacy: empowering food allergic children to be their own advocates in every avenue of life – school, friends, flying, and yes, even the dreaded dating scene. Morgan has been a member of the FAAN Teen Advisory Board and the FAACT Teen Advisory Board. Below are some excerpts from his writing through the years for the newsletter. For more information about traveling, dating and college with food allergies, directly from Morgan, check out our blog. Only once so far. It was to a mining museum. I brought along my EpiPens and Benadryl just in case if something happens. I have chosen on my next field trip, to Bent’s Old Fort in Eastern Colorado, to go with neither of my parents joining. I have to bring safe snacks, my own lunch, and of course my EpiPen. I also bring Benadryl just if I get itchy eyes or something that is mild. I also make sure to have a friend nearby so that he knows what is happening and can tell my teacher to give me my EpiPen if that would ever be necessary. What differences will there be for you in middle school versus elementary school when it comes to foods and food allergies? As you look ahead to Middle School in the fall, how do you feel kids from other elementary schools will treat you once they learn about your food allergies? Do you worry about being teased? What would you do if you were teased? They will treat me I hope as a normal kid. I don’t worry about getting teased. I would tell a nearby teacher about the teasing if it were to happen. What class did you choose to not take? Why? I didn’t choose Home Economics (cooking and sewing) for one reason: FOOD! Even if they have eliminated peanuts from their “menu” workbook, they can still have other allergies of mine. Your 5th grade classroom had a Colonial day at school along with a colonial lunch provided by the parents/students. What food was served? Was it safe for you to eat it? Well.. there was beef jerky, corn muffins, stew, honey butter… beans… and I couldn’t eat it because the food was homemade. Cross contamination could happen. I brought my own food and it was fun. During a school choir concert, breakfast foods were brought in by parents. What did you have to do to ensure you were safe? I had to make sure my music teacher knew that no sesame seeds or peanuts were brought in. My Mom also had to alert the PTO about food allergies and ask people to bring in safe food. Mom made safe pumpkin bread for me. Yum! Tell us about what has worked in the past for Valentine’s Day celebrations at school and what hasn’t. Well, Valentine’s Day has been a very interesting experience, especially with school. Let’s go with what worked first. In third grade, my teacher asked that all the Valentine boxes be put in the hallway. That definitely worked, so that there would be no problems with M&M’s and various other candies that were brought in with the cards. My fourth grade teacher asked that no candy be brought in, and that she would supply safe candy. This definitely worked. What didn’t work? In second grade, a kid brought in peanut M&M’s as treats with his cards. That did not go over well. He was Chinese and knew a little English though so that was technically a misunderstanding. He brought in his cards early, so my teacher was able to send the candy and the cards home and ask his parents to help him bring in something safe. This year I won’t be in school on Valentine’s Day because it’s a teacher workday in our district. There will be no dance for 6th grade like there is for 7th and 8th grade, so there won’t be anything to worry about. Our classrooms won’t have any parties. You turned 12 in January. What did you do for your birthday party? What works and what doesn’t work with your party and with other kids’ birthday parties? I had my party at an indoor Entertainment Center. I baked my own cake so I knew it would be safe. I got the recipe from a friend of mine who had his Mom bake the cake for his birthday party. I have done entertainment centers and my house in past birthday parties. One time it was at a gymnastics place. That worked also. Usually with other kids’ birthday parties the problem was the cake. I didn’t know if it was safe, so I just brought my own cookies or piece of brownie or something that was safe and sweet. Otherwise, the kids who usually invited me checked that the place was safe like no pets or something like that. All of my friends know I have food allergies, and know that I’ll probably bring my own food. You recently went on a Boy Scout camp out for Order of the Arrow (OA). What is the purpose of this camp out? To induct me into the Order of the Arrow. OA is the honor ‘society’ for Boy Scouts. What foods did Mom prepare for you? Did you know what you were going to eat? What happened when lunch came around? I definitely won’t eat food that comes from other sources. It was a big mistake- on my part and on the leaders’ part. Mom’s Comment: There are times when I heave a great sigh of relief, and hearing this story from Morgan induced just that! I’m grateful that Morgan didn’t have any reaction to their food, which for lunch was two pieces of white bread, a slice of cheese and an apple. Many times bread is not safe for him because it crosses with nuts or sesame seeds. Wonder Bread probably contains glue instead of any allergens, so luckily he was fine! Oh what a past month! A lot has gone on and mainly in the past weekend. From April 22nd-24th I was in Las Vegas, Nevada attending a food allergy conference put on by FAAN (Food Allergy & Anaphylaxis Network). What a weekend! I met many of you readers and hope to see more eventually. I met 11 other teens at the conference. I was actually a younger teen there! It was very exciting to get a high school perspective. On Friday, April 23rd, my mom went to the Leaders’ Summit, and I wasn’t invited. So I toured Vegas!! It was a great time and I walked from The Mirage, where the conference was taking place, all the way up to the Bellagio, where the famous water show takes place every 15 minutes or so. It is seen at the end of the movie, “Oceans Eleven.” I think I walked about 8 blocks, which in essence is 1 1/2 miles. It was a great time! Most of all the attendees of the conference stayed at The Mirage. My mom and I didn’t because we needed a full kitchen, which includes an oven, a stovetop, a full refrigerator, and a microwave. We found it at the Hilton Grand Vacation Resort. It worked out fine. We were about 8 blocks away, so it worked out fine. We were on The Strip too. Food wasn’t really an issue. I brought some snacks out to Vegas on the plane in my carry on. We went to an Albertsons in Vegas and bought some food there to last us the weekend. The fish smell in there was overwhelming!! We bought packaged chicken thighs to have along with other items for all our meals. Also, during the Leaders’ Summit when I walked around, I bought a root beer and a peppermint patty during the walk. I didn’t buy anything else that I knew wasn’t safe and/or too expensive. The prices there are crazy! It’s like paying $1 for something that usually costs 10 cents. On Saturday, April 24th, I attended the FAAN Conference put on in a Grand Ballroom. It was great! I got to meet 11 other teens there, and it was a wonderful experience to meet new people, my age and older. It was great to also meet many readers!! The best part was to hear Zac’s story. Zac Chelini has a peanut allergy, and a very severe one at that. He will go into anaphylactic shock if somebody opens a bag of peanuts in the same room as him. He has an airborne allergy. I think it would be terrible to have that much severity of an allergy. Hopefully, at the FAAN Teen Summit in October out in Baltimore or at the next Conference, I will be able to speak. It would be a great experience, especially since I love public speaking! Maybe I will get a chance to talk at both!! Our airline flight on Southwest Airlines to Vegas was great, and we had no problems about them serving peanuts. However on the flight home it didn’t work out. When we got on board, we asked the flight attendant if she knew that there was a peanut allergic kid on the plane. They weren’t aware… So my Mom asked them to not serve peanuts during the flight. They said they would not serve peanuts and they would only serve pretzels, like the flight to Vegas. The flight attendant was very gracious about it and served pretzels to the back half. As the bags were opened, my mind went to Zac, who would’ve gone into anaphylactic shock by now. They would’ve had to make an emergency landing after administering the EpiPen. Thankfully, the smell only lingered for about 5 minutes, and then was gone. My chest tightened up, but it was only anxiety that got to me, which I learned is a really big part of ‘false’ allergic reactions at the FAAN Conference. Hopefully, Southwest will be better about it next time. I’m doing great! My mom and I are seeing if we could have Southwest just stop serving peanuts entirely. Maybe we could hook up Southwest with FAI and FAAN. That would be great!! The FAAN (Food Allergy & Anaphylaxis Network) Teen Summit was the main event in November! The Summit was from November 18th to 20th in Rosslyn, VA which is right on the outskirts of Washington D.C. Almost 100 teens plus 100 parents attended the Teen Summit and it was a blast! Also, no food was allowed ANYWHERE on the premises of the Teen Summit, which made it much easier to manage food! First off, Friday night started with a couple of welcomes and then a video about clinical trials. Clinical trials on food allergies were a big topic during the Teen Summit. Clinical trials are studies that are conducted to see how one can “outgrow” a food allergy. A couple of attendees told their stories about clinical trials as well. They, over a 2 year period, outgrew a food allergy (milk in both of their cases). Along the way, they did have severe allergic reactions, but in the end they can now drink a glass of milk, which is very exciting. After the clinical trials video, Curtis Zimmerman, an inspirational speaker, presented. He played a 200 person game of Simon Says and it was fantastic! He’s a funny man. After Mr. Zimmerman, the teens had a casino/poker night. There was a lot of fun games (Roulette, 5-Card Draw, Blackjack, Yahtzee, etc.) and also stacking cups. 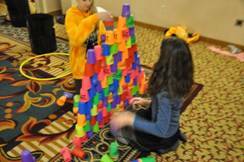 These stacking cups were a big attraction to many teens, and they built huge towers! Saturday morning rolled around, and we started off with many presentations. After a brief welcome from Jen Corey, FAAN’s Teen Program manager, we delved into many different topics. A couple of people talked about clinical trials (those that I talked about above), and Melissa (FAAN Teen Advisory Group member) talked about living with Multiple Food Allergies and other Auto-Immune Disorders. All of the speakers did an excellent job. After breakout sessions, we had lunch. I walked up the street to a Subway and ordered a safe sandwich. All was well. I didn’t stay at the hotel that the conference was in as it didn’t have kitchen accommodations, so we stayed at a Marriott Residence Inn that was 7 minutes away walking. It worked out really well! In the afternoon, we had a few more entire group speakers that talked about traveling and more food allergies, and then we broke into breakout sessions again. This time, it was a discussion about college, and then I had to leave to go talk to the parents. My session with the parents was “Ask Me What you Always wanted to Ask Your Teen”. Lots of questions were asked, including what/what not to do to your middle school child (Don’t go on field trips with them, help them plan parties, etc.) and dating and kissing questions (Tell her BEFORE you get into the moment). Overall, it was really fun and I tried to answer the questions as best as possible! I came back into the Teen Session when a psychiatrist was talking about how anxiety relates to a reaction. Those with less anxiety/worry about their food allergies, and those who don’t carry their EpiPens usually have a more fatal reaction. It was very interesting! After that, we wrapped up for the afternoon, went and had dinner back at the hotel, and then I came back for a Saturday Night Social. At the social, there was soda, loud music, and lots of dancing. Overall, it was really fun! 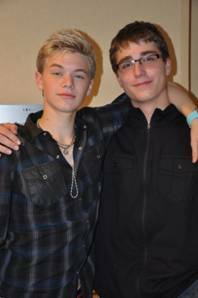 At the Summit, Kenton Duty, an actor on Disney’s show “Shake it Up” attended. He is allergic to chocolate (cocoa) and he’s a really nice guy. At the social, he did photographs and autographs for all the attendees. It was really fun, and in general he’s just a really genuine, nice guy. Sunday morning rolled around, and after Alex (another FAAN TAG member), who talked about testifying for a bill concerning food allergies in Chicago, I got to talk about bullying. My acronym to deal with bullies is TIPS- Tell Someone, Intimidated?, People, People, People, and Stand Up! It was a blast to talk about and at the end the group shared some stories about bullies and then we discussed how to deal with that in the future. Overall, a great experience. At the very end of the Teen Summit, there was a joint session between the adults and teens where we got to ask one another questions about medicine, how to deal with dates, and a whole variety of topics! There was a lot of laughter, and really great answers to some of the questions. During the entire Teen Summit, I was acting as a reporter with Allergic Livingasking questions about hot topics from the Summit and what people enjoyed/didn’t enjoy. I got a few good quotes that I will be using in a blog post for Allergic Living. I’m not exactly sure when it will be posted, but I’ll keep you guys updated! After the Summit, my mom and I toured Washington D.C. for about 2 days. I got to see a huge amount of sights, including the Newseum, the World War II Memorial, the Martin Luther King Jr. Memorial, and Georgetown! It really was a blast, and we brought with us food to eat. I ate Subway along the way for a lunch, but overall, food went really great and I had no problems! This is it. This is my last Morgan’s Corner. As a brief update, I was selected as a semi-finalist (one of 200 out of 1,600 applicants) for the Boettcher Foundation Scholarship. 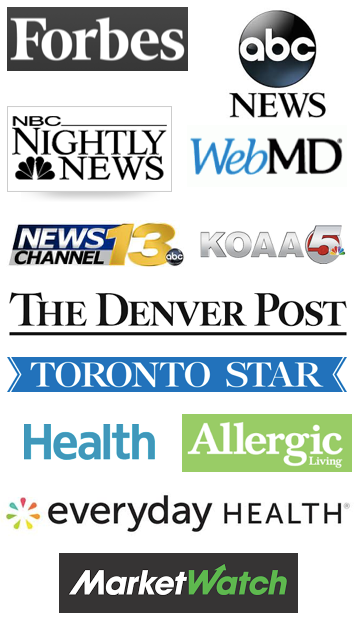 I included my essay on food allergy advocacy in last month’s column. It’s quite an exciting step for a full-ride scholarship to any college in Colorado. I still have plenty to go to get to be one of the 40 recipients of the scholarship. I’ll keep everyone updated about my college plans and scholarships through blog posts on AllergicChild. 1. Have a 504 Plan. Section 504 of the Rehabilitation Act of 2973 provides: “No otherwise qualified individual with a disability in the United States . . . shall, solely by reason of her or his disability, be excluded from the participation in, be denied the benefits of, or be subjected to discrimination under any program or activity receiving Federal financial assistance . . . .” Anaphylactic food allergies are generally classified as a disability. A 504 Plan lists the school accommodations for your child to receive FAPE (Free Appropriate Public Education) – like food free classrooms, washing hands, cleaning techniques for counters and carpets, and policies for carrying epinephrine auto-injectors. My 504 Plan was the single most important thing I had in elementary school. I still have it in high school, however, there is less importance placed upon it because I have learned to self-advocate. 2. Don’t be afraid to tell people about your food allergies. Everyone wants to fit in with people, and most of us believe that telling people (friends and school staff) about your food allergies will cause them to exclude us. I’ve found that exactly the opposite occurs. People are naturally kind and caring and will take care of you so much more than you could ever hope. Friends become the best advocates and will keep you safe. While it may be scary to tell kids about your food allergies, it is so important to let others know you have food allergies so they can keep you safe and take care of you if something happens and you eat something you’re allergic to! 3. Love your food allergies. I’ve heard a lot of kids wish they didn’t have food allergies. I don’t actually understand this. Throughout the years, I’ve gotten the best treatment at hotels and camps. For example, at a Boy Scout camp, I got steaming hot waffles and sausage with orange juice while my fellow scouts got stale cereal and rubbery eggs – all because I had food allergies! While I would be super excited to see a cure for food allergies, it probably won’t be around for a good amount of time. I have faith that we all can accept our food allergies and love them – because, hey, we all want to get treated special (or at least I do)! 4. Become a self-advocate. As a parent, you’re not always going to be there for your child. That’s a scary thing to think about – I’m sure my mom is freaking out about college. However, I was taught from a young age that I have the ultimate capacity to take care of myself. This didn’t happen overnight either – it was cultivated through years and years of practice, presentations, and conversations. I always tell parents to start small, like ordering at a restaurant. Have your child order their meal, but then have you as the parent explain their food allergies. The next time, have your child do both with you as support. Eventually, they’ll get to the point of ordering food with no problem. Expand that to presentations in front of a class about food allergies, training of EpiPens with friends (keep those expired ones – they become great training tools! ), and traveling. It’s a lot to consider, but teaching your child to take care of himself/herself is so important. 5. Make three really good friends. While making friends is a super important thing in general, having three super close friends is an excellent thing for a food allergic child to have. These friends become advocates. For example, when my 5th grade class was touring a middle school, our guides were handing out candy, notably Snickers and Milky Way. Before I could even say anything, my best friend started with, “Morgan can’t eat that – he has food allergies.” I was so surprised! Really close friends become advocates in all kinds of situations – they look out for you when you’re traveling, hanging out, or at school. They care for you. 6. Love your parents. Out of everything that any food allergic child could do, it would be this. Your parents are so amazing in their capacity to care for you and make sure you’re 100% ok, 100% of the time. I am so grateful for my mom and my dad for taking care of me these past 17 years with food allergies, and I cannot thank them enough. Although they may be nagging you to remember your EpiPens or to call them when you get to your friend’s house, it’s because they love you and want to make sure you’re okay. I want to thank all of you. It’s been a fantastic 8 years of writing this column. I’ve certainly had amazing opportunities because of this. All of you have made this experience so spectacular. I want to thank each and every one of you for coming along on this journey – it’s been amazing. As individuals living with food allergies, I think that’s the best piece of advice we could ever have. Don’t burn bridges with teachers or parents. Always look for the opportunity to educate someone on food allergies instead of getting angry at them for not understanding the severe consequences of food allergies. It’s okay to get emotional about food allergies (in fact, maybe I’ll stop crying while writing this, but not anytime soon). Merry Christmas, Happy Hanukkah, Happy New Year, and best wishes for the future! Do you have a question you’d like Morgan to answer? E-mail Nicole at Nicole@AllergicChild.com and Morgan will answer your question in a blog post or directly to you.